Scalr needs access to your Cloud Platform(s) in order to provision and manage infrastructure on your behalf. You will therefore need to configure Scalr with your GCP credentials. There are 4 steps to this task. 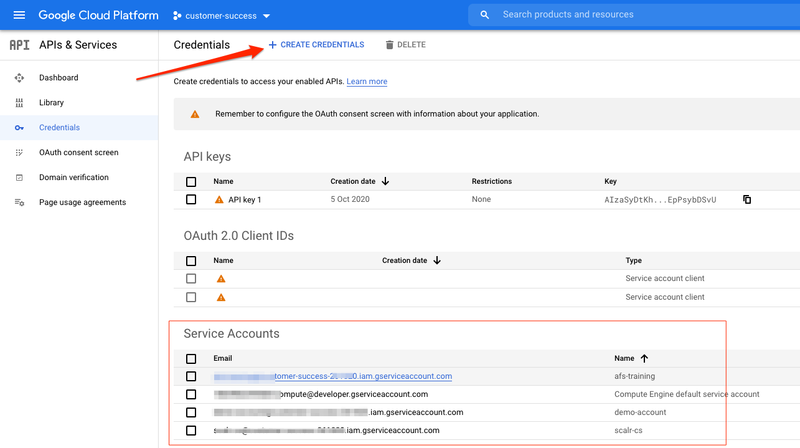 Add GCP credentials to Scalr and link to Environments. 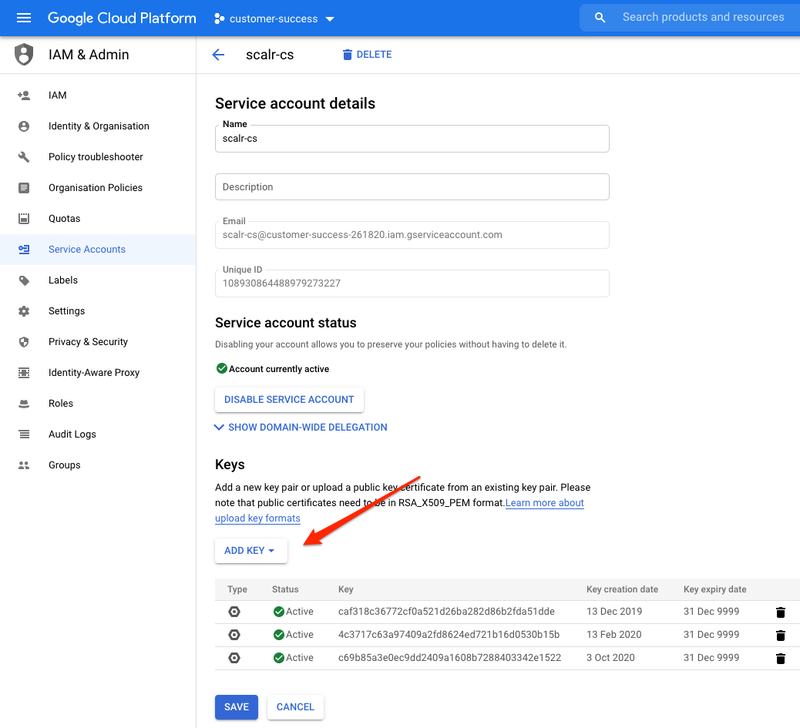 Before creating access keys and connecting Scalr to GCP there are some configuration considerations that may need to implemented to ensure Scalr can connect to your instances in GCP. You will need to create or configure a GCP VPC to work with Scalr. Every GCP user has access to a default network but this is typically NOT an acceptable network for most use cases. If you need to create a VPC for Scalr and the Scalr managed instances please refer to Using VPC Networks . You will also need to perform some additional configuration work to ensure that Scalr can connect to your GCP instances. There are three options for this. You have routing or peering connections to all the other VPC’s where Scalr managed instances reside. See VPC Network Peering for more details. 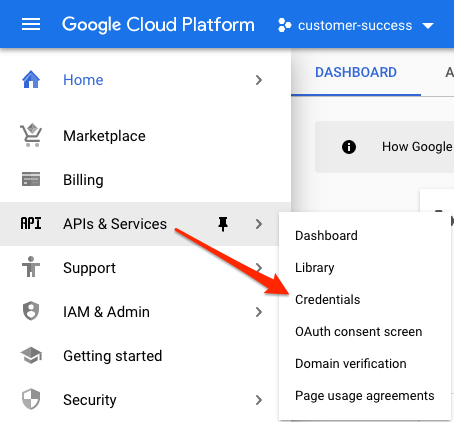 First you need to create and obtain the required access keys from GCP. Login to the Google Cloud Console and select the project you want to use with Scalr, then note down the Project ID. Select “API’s and Services –> Credentials” from the menu bar. On the Create Credentials drop down select “Service account key”. Set the drop down to “Compute Engine default service account”, and select “JSON”, then click . Save the JSON file to your computer and then go back to the Scalr UI. Click on “UPLOAD JSON KEY”, enter the Project ID from step 1 and select the JSON file you downloaded in step 5. Click Save and the credentials will be validated and saved. The Scalr billing integration relies on exported billing data . The cloud credentials added in Scalr must have access to bigquery.dataViewer in the GCP Project where the billing dataset is located. To enable billing, which allows for Scalr Cost Management to report on GCP costs, please click Enable Detailed Billing and add the Dataset Name. Once that is added it may take a few hours for the cost to show up within Scalr.